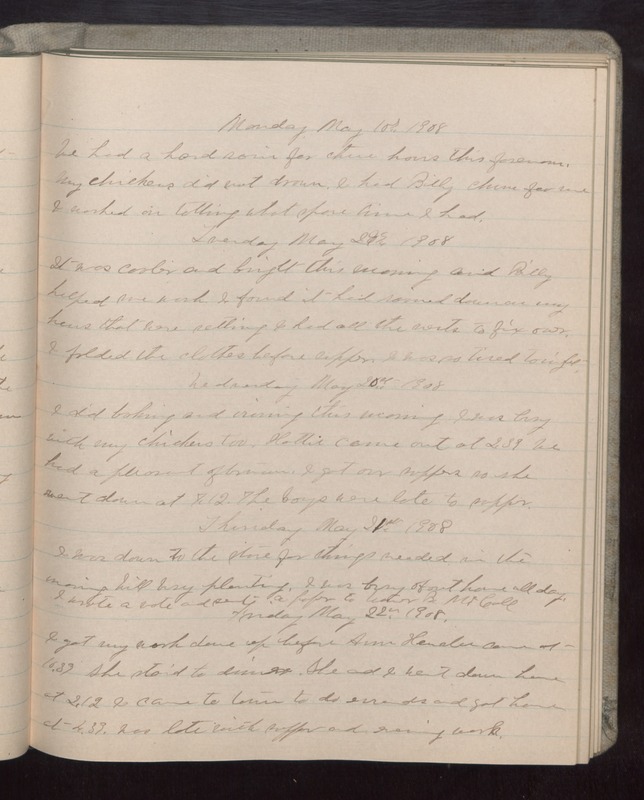 Monday May 10 1908 We had a hard rain for three hours this forenoon. My chickens did not drown. I had Billy churn for me. I worked on tatting what spare time I had. Tuesday May 19 1908 It was cooler and bright this morning and Billy helped me work. I found it had rained down on my hens that were setting I had all the nests to fix over. I folded the clothes before supper. I was so tired tonight. Wednesday May 20 1908 I did baking and ironing this morning. I was busy with my chickens too. Hattie came out at 2.39 We had a pleasant afternoon. I got our suppers so she went down at 7.12. The boys were late to supper. Thursday May 21 1908 I was down to the store for things needed in the morning. Will busy planting. I was busy about home all day. I wrote a note and sent a paper to [illegible] B. McCall Friday May 22 1908 I got my work done up before Ann [Hensler?] came at 10.39. She staid to dinner. She and I went down home at 2.12 I came to town to do errands and got home at 4.39. Was late with supper and evening work.